Wright Rain® has long been recognised as one of the most well known and respected brands of agricultural irrigation equipment in the world, having been awarded the Royal Warrant and achieved the Queen's Award for Export. 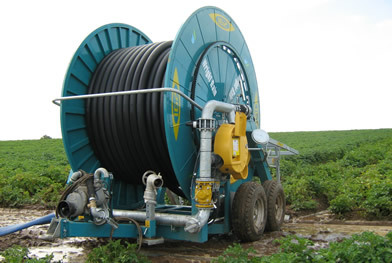 Agricultural and horticultural clear water crop irrigation and land dispersal of dirty water. 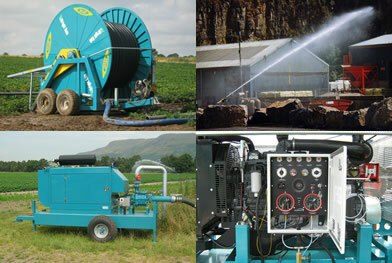 Overseas crop irrigation equipment supply. International crop irrigation design consultancy and turnkey project management. Wright Rain produces its own range of aluminium pipes and cast aluminium fittings, together with sprinklers, Rainmaker hose-reel irrigation machines and tractor PTO, diesel engine and electric motor driven pump units. Manufacturing work is undertaken in the UK, Italy and Spain and we have close associations with a number of key partners throughout the world in order to provide the necessary financial and structural resources to compete effectively on international tenders. UK and export business is co-ordinated from our sales and central distribution facilities at Ringwood, Hampshire and Northampton, together with a national network of specialist machinery dealers who provide local support to UK farmers and growers. Wright Rain was founded over 50 years ago by Jack Wright to supply irrigation equipment to the agricultural industry, initially manufactured on his own farm. Under Jack’s innovative and pioneering leadership the company grew dramatically over the next two decades. With the building of a specialist factory on adjoining land, we secured many large overseas contracts for the design, manufacture and installation of irrigation systems, which were undertaken in many developing countries, especially in sub- Saharan Africa. The Wright Rain factory was equipped with the latest manufacturing plant available at that time, for foundry production of aluminium and bronze castings, and automatic turning machines for sprinkler components and assembly. This was soon followed by a testing station which could measure the water distribution of sprinklers with different nozzle combinations and pressures under controlled conditions, thus ensuring accurate data was available to determine the optimum spacings for the high quality sprinklers that became the hallmark of Wright Rain. We then installed PVC extrusion plants, which enabled us to produce PVC pressure pipes up to 6" diameter for underground mains, followed by aluminium seam welding process lines for portable aluminium pipes up to 8" diameter. Tractor PTO, diesel engine and electric motor driven pump units were also designed and built in our factory at Ringwood. Please browse our web site to view the current range of equipment and services we offer. If you require additional information please use the contact page to get in touch with us.